Ariana Grande in “thank you, next”, aka how to cope with life when it gives you lemons, but you really had enough of the lemonade. Ariana Grande has released her new single this weekend and we are LOVING THE HELL OUT OF IT. She had already dropped an award winning album, “Sweetener”, earlier this summer, with hits such as “God is a Woman” and “No Tears Left To Cry”. 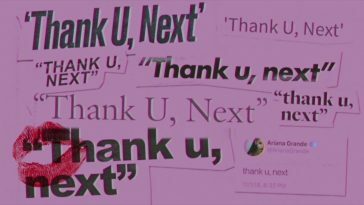 The honest lyrics seemed pretty autobiographical (true to her style), but with “thank you, next” there is no space left for doubts. This new motivational, therapeutical, self-loving and most of all empowering hit is somewhat of a feminist anthem. It teaches us to hold on when times get rough and that every bump on the road can somehow show us how to drive on. She mentions her ex-boyfriends and how she has learned something from each of them, throwing a sort of sweet shade that -appropriately- doesn’t turn into dissing. Although gossip is what everyone is looking for, the focus of this song is really on her and on her learning to trust herself and to stay positive, rather than about a list of renown ex boyfriends (although yes, she names all of them). The delicate harmonies typical of Grande’s style intertwine with a pop/r’n’b mix with must-sing-along lyrics. We recommend it when: it’s monday morning and you clearly need a confidence boost. By the end of the track you’ll feel it’s time to summon your inner Ariana and go outside to show the world what you’ve got.